Following in the footsteps of Oppo and Vivo, Xiaomi is now in the rumours for designing the Mi Mix 3with a pop-up camera. Some early renders of the new Mi-Series model already suggested that there will be a pop-up selfie camera similar to the Vivo Nex. And now, it is reported that the handset will debut sometime in September. An alleged teaser image has surfaced online to hint at the launch schedule. While there isn’t any clarity on the Mi Mix 3 that will be the successor to the Mi Mix 2S, Xiaomi is also nowadays in the headlines for preparing the Mi Max 3 launch. An LCD assembly has been listed on Alibaba Group-owned AliExpress that highlights the front panel of the yet-to-be-announced Mi Max model. A leaked teaser revealing the launch of the Xiaomi Mi Mix 3 has been spotted on Chinese social media Weibo, reports by Playfuldroid. The alleged leaked teaser highlights the pop-up camera of the new Mi Mix mode without highlighting any of its key features. It is uncertain whether the teaser has been designed formally by Xiaomi or a third-party source. 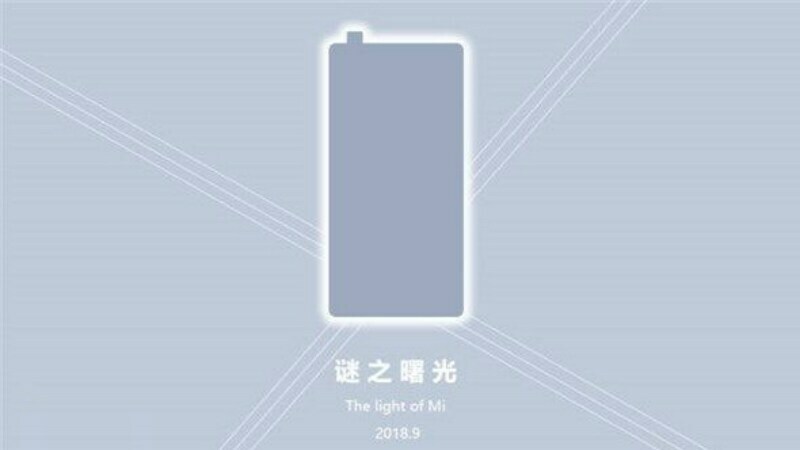 However, the image points at the September launch by showing the “2018.9” text alongside featuring a silhouette allegedly of the Mi Mix 3. As per a previous report, the Mi Mix 3 will offer a higher screen-to-body ratio compared to the Mi Mix, Mi Mix 2, and Mi Mix 2S. Xiaomi had also reportedly filed for a patent in 2015 specifically for the pop-up selfie camera. The elevating module is also likely to have a room for an LED flash. Further, it will remove the chin that was available on the preceding Mi Mix models to host the selfie camera module. Similar to the Vivo Nex-Series and Oppo Find X that both have a full-screen experience with no camera sensor at the front, the Mi Mix 3 is expected to offer large display area on the front with ultra-thin bezels. The early renders of the smartphone also hinted at the absence of a fingerprint sensor. This suggests that just like the Vivo and Oppo models, the Xiaomi model will come with a face unlock feature and might have an under-display fingerprint sensor. We may need to wait until at least September to see the Mi Mix 3 in reality. However, in the meantime, AliExpress has listed the LCD assembly of the Mi Max 3 to highlight the thin-bezel display of the Mi Max successor. The assembly, which was available for purchase at the time of filing this story, suggests an 18:9 aspect ratio – without any display notch. The online listing doesn’t have any details about the Mi Max 3. Nevertheless, Xiaomi CEO Lei Jun recently shared an image of the retail box of the upcoming handset to confirm its development. The retail box features the “Mi Max 3” moniker at the top and right side to confirm the development. Also, a recent TENAA listing revealed that the new Mi Max model will come with a 6.9-inch full-HD+ (1080×2160 pixels) display with an 18:9 aspect ratio. It is likely to come with an octa-core Qualcomm Snapdragon 636 SoC, though some initial rumours pointed at the Snapdragon 710 SoC. Also, the handset is expected to have up to 6GB RAM and up to 128GB of onboard storage. The storage will also be expandable via microSD card, and the handset will include a dual rear camera setup with a 12-megapixel primary sensor, if we believe some previous reports. Furthermore, it is claimed that the handset will have a 5400mAh battery. GizmoChina reports that a leaked image has highlighted that the Mi Max 3 will come with a price tag of CNY 1,699 (approximately Rs. 17,600). This is a bit higher than the price of the Mi Max 2 that was launched in India in July last year at Rs. 16,999.